Health research traditionally has been organized much like a series of cottage industries, lumping researchers into specialty areas, where their efforts remain disconnected from the greater whole by artificial barriers constructed by technical and language differences between different disciplines and departmentally-based specialties. But, as science has advanced over the past decade, two fundamental themes are apparent: the study of human biology and behavior is a wonderfully dynamic process, and the traditional divisions within health research may in some instances impede the pace of scientific discovery. The broad goal for the IR program therefore, was to change academic research culture, both in the extramural research community and in the extramural program at the NIH, such that interdisciplinary approaches are facilitated. The Interdisciplinary Research Program included initiatives to dissolve academic department boundaries within academic institutions and increase cooperation between institutions, train scientists to cultivate interdisciplinary efforts, and build bridges between the biological sciences and the behavioral and social sciences. Collectively, these efforts were intended to change academic research culture so that interdisciplinary approaches and team science are a normal mode of conducting research and scientists who pursue these approaches are adequately recognized and rewarded. A total of nine Interdisciplinary Research consortia were funded through this initiative. Investigators within each consortium developed integrated research projects, core services, training programs, and administrative structures to ensure consortium members work together fluidly and with a common purpose. Institutions where these consortia were housed provided administrative support for the goals of the program, ensuring that team members were adequately recognized and that boundaries between departments or schools within the university did not interfere with consortia goals.The consortia were designed to allow teams of investigators to self-assemble to develop an interdisciplinary approach to complex health problems. They were also designed to provide a new way of doing business at the NIH. The consortia tested a new mode of program administration within the NIH. Although each consortium was designed as a single, integrated project, the individual components were funded as separate, but linked, awards issued by the most scientifically relevant IC. Therefore, each consortium was managed by a team of program staff, each of whom oversees a component of the consortium. Team administration at the NIH ensured that the appropriate scientific expertise to guide the consortia was available. This level of trans-NIH cooperation in the management of complex projects was new for the NIH and promised to provide a mechanism for increased collaboration in the future. The training initiatives were developed to provide interdisciplinary training to investigators at all career stages. Investigators trained in one discipline were therefore given the opportunity to learn a new discipline and merge it with their prior training to forge new interdisciplinary approaches. Two major efforts were funded to train scientists to perform interdisciplinary research. The Interdisciplinary Health Research Training program enabled institutions to develop postdoctoral training programs that provided formal coursework and research training in a new interdisciplinary field to individuals holding advanced degrees in a different discipline. These training programs typically integrated the behavioral and/or social sciences with more traditional biomedical sciences research. In addition, the program also supported broad and fundamental early-stage graduate training in the neurosciences. Another program, entitled Training for a New Interdisciplinary Workforce, supported scientists at the undergraduate, graduate, and post-doctoral levels. This initiative was launched to advance the understanding of health through the development of new/innovative methodologies and technologies to support the interdisciplinary integration of social and/or behavioral scientific disciplines with other disciplines. This initiative supported proposals that integrated various levels of analysis, ranging from sub-individual to population levels, acknowledging that individuals are heavily influenced by actions occurring at various levels: from genomic, molecular, cellular, and organ systems, to family, workplace and community levels, to state, national, and global socioeconomic, environmental, and geopolitical factors. This initiative supported the development of interdisciplinary research tools, or methodologies and technologies including measures, research designs, as well as analytic methods and techniques. A major change for the NIH that was in part spurred by the IR program was the policy, launched in 2007, to recognize multiple PIs on NIH grants. The Multi-PI Policy for awards was implemented beginning with grants with February 2007 receipt dates. By recognizing team leadership, the NIH hopes to encourage institutions to reward and recognize successful science teamwork through career advancement. Implementation of this policy is not complete however. Although PIs within a single institution are recognized as equals, PIs at different institutions must establish a hierarchy such that only one institution receives an award. The implementation plans for the Multi-PI policy call for changes to the NIH computer systems that will accommodate linked awards to PIs working at different institutions so that all PIs will have equal stature. For more information on the Research Teams of the Future Interdisciplinary Research initiatives, contact Melissa W. Riddle, Chief, Behavioral and Social Sciences Research Branch, (301) 451-3888, National Institute of Dental and Craniofacial Research, riddleme@mail.nih.gov. Interdisciplinary Research program has transitioned from Common Fund support. Common Fund programs are strategic investments that aim to achieve a set of high impact goals within a 5-10 year timeframe. At the conclusion of each program, deliverables transition to other sources of support or use within the scientific community. 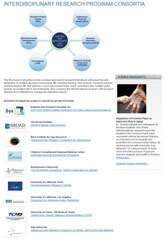 The Interdisciplinary Research program was supported by the Common Fund from 2005 through 2012. Currently, policies to facilitate interdisciplinary research and training initiatives developed through this program are in use by the scientific community, and many Interdisciplinary Research Consortia are continuing via other sources of support. Please note that since the Interdisciplinary Research program is no longer supported by the Common Fund, the program website is being maintained as an archive and will not be updated on a regular basis.